US Senator from Arizona Kirsten Sinema holds a law book as she is sworn in by Vice President Mike Pence on January 3, 2019. Kyrsten Sinema has become the first openly bisexual person to take up a seat in the US Senate. The Arizona Democrat was sworn in on January 3 after a narrow victory in November’s midterm elections, becoming the first out bisexual person, and only the second out LGBT+ person elected to the Senate. 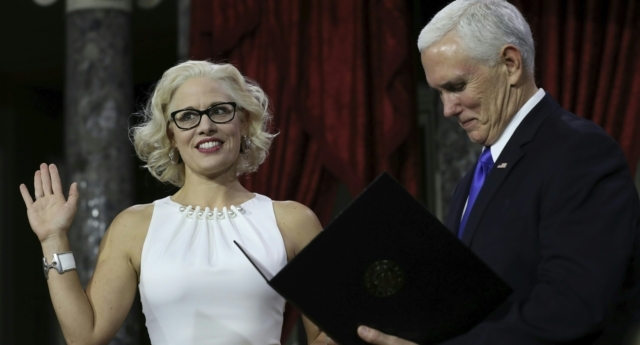 Ironically, the duty of swearing in the newly-elected Senator Sinema fell to Vice President Mike Pence, known for his opposition to LGBT+ rights. The incoming senator, who is divorced hasn’t remarried, cracked a joke with Pence when she noted the empty spot where a senator’s husband or wife would usually stand. Sinema is also the only current member of Congress who is openly religiously unaffiliated, and instead of a Bible opted to get sworn in on a law book from the Library of Congress containing texts of the US and Arizona constitutions. Congress has seen an overall boost in LGBT+ representation, with ten out lawmakers across the House and Senate. Sinema’s Senate race was one of the closest on election day, eventually prevailing with 1,191,100 votes to opponent Martha McSally’s 1,135,200. Perez said: “Arizonans went to the polls looking for bold new leadership, and that’s exactly what they’re going to get with their first-ever female senator and our nation’s second openly LGBTQ senator. Annise Parker, CEO of the LGBTQ Victory Fund, said: “An LGBTQ woman winning a U.S. Senate seat in a state that voted for Trump is a game-changer, both for the LGBTQ community and the Democratic party. “Kyrsten’s victory makes clear that an LGBTQ candidate who listens to voters and prioritises their issues can win elected office anywhere—blue state or red state.